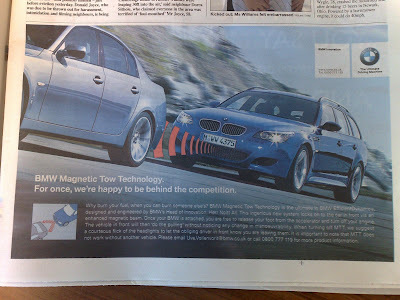 BMW Magnetic Tow Technology - April Fools Day creative 2009! New - BMW April Fools Day 2012 - the BMW Driverless Running Coach! BMW Magnetic Tow Technology is a great follow up to last years Canine Repellent Alloy Protection - Happy April Fools Day! UPDATE: There is a page on the BMW website that explains Magnetic tow technology and people in the UK can phone 0800 777119 for a Magnetic tow message ("It sounded good, but as we all know, there is no such thing as a free ride.") There is also the opportunity to email uve.vollenvorit@bmw.co.uk with Magnetic Tow Technology feedback! April Fools Day 2013 - BMW P.R.A.M. April Fools Day 2009 - Waitrose advertise Pinanas! Of course knowing the date so like many people I was taking almost everything in the newspaper with a large glass of scepticism. I wonder how many people emailed Mr Know-it-all at his 'you've fallen for it@bmw.co.uk' addy to seek more information? btw, this emerging technology is a variant of the concept which is already well known to devotees of 'Star Trek' where the good ship Enterprise has often demonstrated an ability to use 'tractor beams' to lock on to other craft / vehicles, albeit usually to pull them towards it, rather than as an alternative form of motive power.